Saturday 16th December, Sunday 17th December, Monday 18th December, Tuesday 19th December, Wednesday 20th, Thursday 21st, Friday 22nd December and Saturday 23rd December. 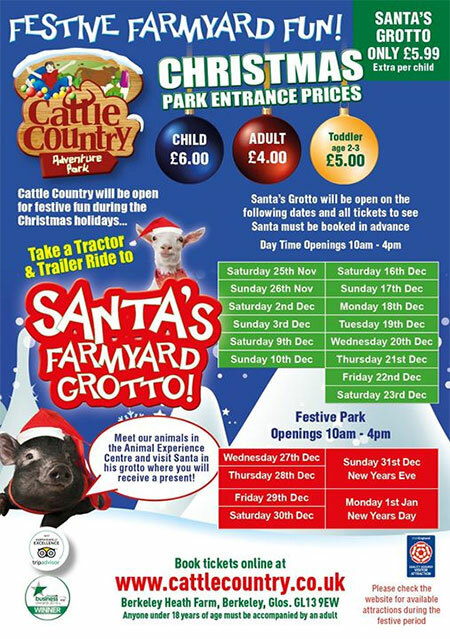 This year children will be taken on a tractor and trailer ride around the farm before being dropped off at Santa’s Farmyard Grotto in our Animal Experience Barn. Each child will receive a present from Santa. Make sure you are at the Festive Tractor Stop 15 minutes before your time to depart. Both play barns, animal experience centre and cafe will be open. Sorry but the climbing net, boating lake and jumping pillows will not be open during these dates. Calf Feeding: 12.00 in the animal experience centre. Small animal handling: 11.00 to 11.45 and 13.30 to 14.30 in the animal experience centre.